Like many of you, we had a busy holiday weekend. I had a great time hosting a couple of family gatherings at my house. We had a cook-out one day with hamburgers, hot dogs, and a smorgasbord of toppings (guacamole and bacon, anyone?). Then another day, we hosted a tea party with tarragon chicken salad on croissants, cream scones, and butter cookies. It was all fantastic but now I am ready for a break. After a weekend like that, I want breakfast the next day to be quick and easy. Thank goodness for steel-cut oatmeal in the crockpot. I put the steel-cut oats, milk, and water in the crockpot to cook before going to bed and then wake up to a hearty and healthy breakfast in the morning. Now, I am ready to re-charge and tackle the last week of school before summer vacation starts. In a 6 quart crockpot, stir together steel-cut oats, water, and milk. Cover with lid and cook on low setting for 3 hours. When cooking time is over, stir in salt. Serve with choice of toppings. If you are planning to cook the oatmeal overnight, increase water to 5 1/2 cups and milk to 3 cups. Cook 3 hours and let sit on warm setting until morning. Leftover oatmeal can be stored in the refrigerator for a couple of days. To reheat, spoon desired amount of oatmeal into a microwave safe bowl. Add a splash of milk. 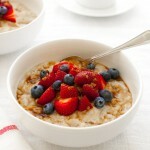 Warm oatmeal in the microwave at medium power for 1-2 minutes. Stir. Add more milk as necessary and continue warming in microwave, until the oatmeal is creamy and heated through.